If that is your case, then the first thing you need to think about is your layout. You cannot begin to plan your new room unless you know what is going to go where and how! Kitchens in a U shape – Ideal for kitchens which have an interruption due to a door or window of at least three times. 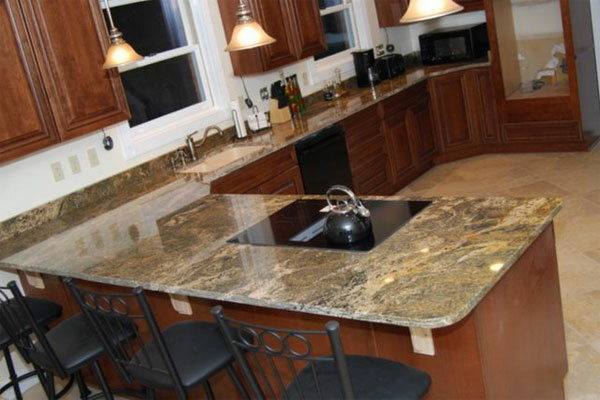 Do you want an island in your kitchen? Do you want a table? How do you want the kitchen to feel? You need to think, think some more, and then think again before making any plans! First things first however, you need to measure the room very carefully. Ceiling heights. When ordering new cabinets you need to get the measurements right, so that means first of all measuring the distance between the floor to the ceiling. Doors and windows. Next up you need to measure the actual doors and windows, and then the distance which spans from the side of the aperture to the walls. You also need to factor in any wall pillars or boxing. Add on 600mm when measuring the distance between walls, because this will give you a little leeway in terms of how your cabinets will sit. Are your floors level? With a spirit level check that your floors are sitting totally level and if not, you may want to consider rectifying this before you start with any work. Add on a little extra for any metres or service measurement aids that are in your kitchen, e.g. water pipes etc. Make sure these feature in your plans to avoid messing up your measurements. Once you have measured your kitchen, you can begin to make many decision from that point onwards. What sort of design do you want? Do you want to go modern, or do you want to go traditional? You need to decide on this next, because this will shape the rest of your design work. What kind of classicquartzstone worktop do you want? You can go for a natural stone choice, or you can go for laminate – this is a decision you need to make, but it pays to shop around and clue yourself up on the pros and cons of each material, as well as thinking about the shape you want. The actual layout of your cabinets and appliances. Where do you want things to go? Draw up a plan and even go as far as to say where your kettle is going to go! Generally speaking, you need to make sure you put your sink under a window, and you need to think about dishwashers and drainage, so this needs to be close to the sink. Are you going to do it yourself, or are you going to hire a professional? If you have some DIY and kitchen design knowledge, you could do it yourself, but if you aren’t so sure, it’s always best to go for a professional. We are talking about a lot of cash to invest here, so make sure you give yourself the best shot at having a wonderful end result. Designing and working on a new kitchen is not an easy task, and it is one which requires a lot of pre-thought and work, but once it is done, you really will have a shiny new space to enjoy. This entry was posted in Home Improvement and tagged Corridor Kitchens, kitchen countertops, Kitchen Design, Kitchen Layouts, Kitchen Measure, kitchen worktops, Measure your Kitchen, new kitchen, Types of Kitchen Layouts. Bookmark the permalink.